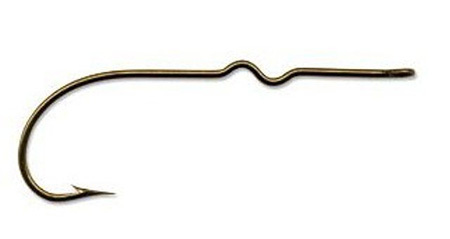 These light wire hooks with a durable bronze finish are my first choice in most popper hooks. You may add these to any blockhead order in the quantity you desire. #4 Mustad with kinked shank is perfect for the Medium size foam blockhead popper. Strong but lighter wire is perfect weight and proportion for the foam body. Wrap with 3-4 layers of thread and use Zap A Gap Medium to coat it before inserting and aligning in the popper body. This hook has a perfect gap and shank extension out of the back of the body of the popper insuring solid hook -ups on the take.